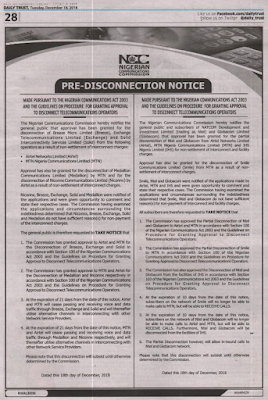 The Nigerian Communications Commission (NCC) has granted disconnection approval to mobile network operators (MNOs) to disconnect owing colleagues over rising in interconnect debt and failure of the affected operators to pay. 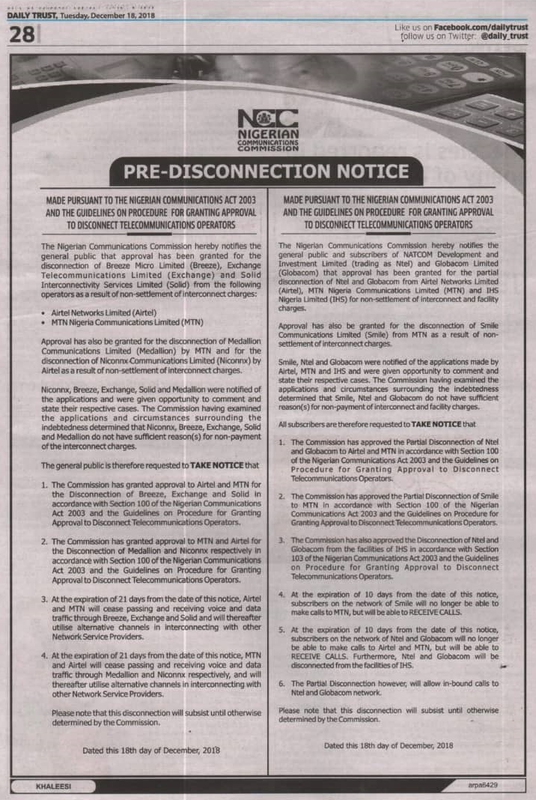 NCC has sent notification letters to the affected operators, asked MTN, Airtel and IHS to disconnect, on partial basis, services to Globacom, Ntel (MNOs) and interconnect exchange points including Breeze, Exchange, Solid, Medallion and Niconnx. The implication of this development is that some millions of subscribers would soon start to experience service disruptions. Over 35 million subscribers might be affected if the disconnection move is implemented. The Commission also said it has approved the Disconnection of Ntel and Globacom from the facilities of IHS in accordance with Section 103 of the Nigerian Communications Act 2003 and the Guidelines on Procedure for Granting Approval to Disconnect Telecommunications Operators. The Commission informed that 9Mobile, Smile, and Swift are also to be disconnected from IHS facilities and ATC Wireless Infrastructure Limited. While the affected operators have between the next 10 and 21 days, starting from 18th Dec to make amends or risk disconnections, Globacom currently has 41.5 million subscribers; Ntel as at March had about 150,000 subscribers, while millions of voice and data pass through the affected exchanges on a daily basis. At the expiration of 10 days from the date of this notice, subscribers on the network of Ntel and Globacom will no longer be able to make calls to Airtel and MTN, but will be able to receive calls. Furthermore, Ntel and Globacom will be disconnected from the facilities of IHS.